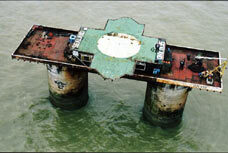 The former British WWII base, Roughs Tower, declared itself an independent country in 1967 and became known as Sealand. In 1968, it fought a "War of Independence" against the Royal Navy. Johannes Seiger is Sealand's Prime Minister. Adventurous investors are being offered the chance to run one of the world's smallest countries. Sealand, an independent state based on a former anti-aircraft fortress seven miles off the coast of East Anglia, will celebrate its 40th anniversary this September. The nation's owners and self-styled royal family are now looking to transfer tenancy to an investor, although they say it is technically not for sale because sovereignty cannot be sold. Gabriel Medina, owner of Granada-based estate agency InmoNaranja, said Sealand's starting price was 750 million euros (£550 million). Those interested in making a bid must also propose a project for Sealand's future, he added. The tiny country - whose area is just 550 sq metres - came into being on September 2, 1967, when Roy Bates, an English army major, declared it a sovereign principality. It is based on Roughs Tower, an island fort built by Britain in the North Sea during the Second World War to guard approaches to the Thames Estuary. Sealand has issued its own stamps, passports and money, and Mr Bates and his family call themselves princes and princesses. Last June, a fire that started in the main power generator caused an estimated £500,000 worth of damage to Sealand. Mr Bates's son, Prince Michael of Sealand, said his family hoped to raise money to invest in the country. He told the Ipswich Evening Star: "You cannot sell sovereignty so we will still own Sealand and be its royal family but this is a chance for someone to live there and run Sealand on a day to day basis, though they would have to agree to the country's laws and constitution. "We have had this idea in the past and we spoke to an estate agency that deals in islands and thought 'let's give it a go and see what happens'." Independence - claimed its independence from Britain in 1967. Roy Bates, who later became the country's Head of State, was found guilty of illegal radio broadcasts to the British mainland from HM Fort John Knox. He then moved his radio equipment to HM Fort Roughs, expelled the occupants and later claimed it as his own. He re-named it Sealand. A judge then said that as it was in international waters it was free to become a state in its own right. Wars - A minor War of Independence with Britain in 1968 when the Royal Navy tried to evict Roy and his wife from the fort. There was also a "skirmish" with Holland and Germany in the late 1970s when a couple of Dutch and German businessmen invaded the fort and kidnapped Roy's son, Prince Michael. However, they were overpowered and held as prisoners of war until being released. Constitution and government - Sealand possesses a constitution, instituted in 1974  , which consists of a preamble and seven articles. The preamble asserts Sealand's independence, while the articles variously deal with Sealand's status as a constitutional monarchy, the empowerment of government bureaus, the role of an appointed, advisory Senate, the functions of an appointed, advisory legal tribunal, a proscription against the bearing of arms except by members of a designated "Sealand Guard," the exclusive right of the sovereign to formulate foreign policy and alter the constitution, and the hereditary patrilinear succession of the monarchy. The origins of this mintage date to 1978, when Sealand's then Prime Minister, Professor Alexander G Achenbach and several associates abducted Prince Roy's son, Michael, as part of an attempted armed takeover of Sealand. Prince Roy re-took Sealand in a helicopter-led assault and imprisoned Achenbach for several weeks. Following his release Achenbach returned to Germany and established an "exile government" which he headed as "Chairman of the Privy Council". In August 1979 he retired "due to health reasons", and annointed as his successor his Minister for Economic Co-operation - Johannes Seiger. Seiger continues to head the rebel government to the present day with the titles of "Prime Minister and Head of the Privy Council". 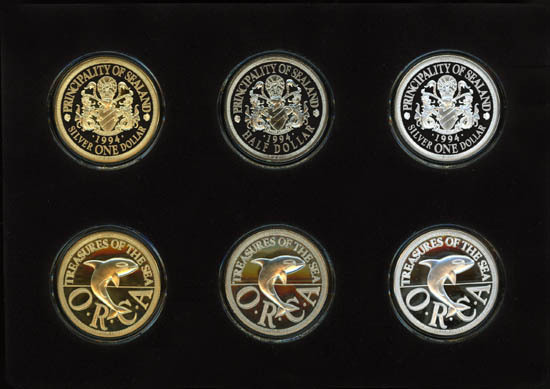 This coin is believed to represent, uniquely, a mintage by a rebel group within a new country project. National football team - The country's home kit is red shirts with black shorts. It's away kit is all white. It's first game was at the beginning of 2004 - amazingly, Sealand drew 2-2 with the Czech Republic. Sealand's worst defeat came in 2006, when it lost 6-1 against Northern Cyprus. Sealand's manager is Christian Olsen. "The Principality of Sealand recognizes jus gentium and has undertaken to regulate any activity with a view to compliance with jus gentium and international law or to have it regulated." The existence of the Principality as an independent State and the de facto recognition of its sovereignty has been demonstrated time and time again over the last three decades by European and other States and in particular by its nearest neighbour, the United Kingdom. Britain has stated clearly and has demonstrated on a number of occasions either that it has no jurisdiction within Principality territorial limits or that it has no interest in events that have taken place within the Principality. Moreover, a number of independent legal experts have weighed carefully all arguments for and against Sealand sovereignty and unanimously have agreed that jus gentium applies as a basic principle underpinning the independence of the Principality. This position is further supported by de facto events which demonstrate that reality. On many occasions, other States have either left Sealand alone to deal internationally with matters critical to its National interest, or have recognised Sealand as the legal and administrative authority over all activities within its territorial limits. Even today, the United Kingdom government recognises, inter alia, residency or work in Sealand as an overseas activity. Last edited by Blackleaf; Jan 9th, 2007 at 02:50 PM..